You can only control 1 “Gashadokuro, the Skeletal Mayakashi”. You can only use each of these effects of “Gashadokuro, the Skeletal Mayakashi” once per turn. ● If a Link Monster in your possession is destroyed by battle or an opponent’s card effect while this card is in the GY: You can banish 1 other Zombie monster from your GY, and if you do, Special Summon this card. ● If this card is Special Summoned from the GY: You can activate this effect; this turn, this face-up card is unaffected by other cards’ effects. No. That’s a bad boss monster. Gashadokuro, the Skeletal Mayakashi is a Level 11 Dark Zombie-type Synchro Monster with 3300 Atk and 2600 Def. The summoning requirements are generic, but the Level is a bit high for such lackluster effects. You can only control 1 G,tSM and then the other 2 effects can only be used once per turn. The first effect is to revive itself from the grave when your Link Monster is destroyed by your opponent and it costs you banishing one other Zombie from your grave. Yikes. you can’t destroy your own stuff, it doesn’t say “leaves the field,” and the archetype Link Monster is meh. The second effect is just as bad. When revived G,tSM is unaffected by card effects for one turn. One turn? Don’t pop anything, don’t bring anything else with you to push for game, and don’t search or replenish resources. Defense doesn’t win games. Bosses that lose to Waboku make me laugh. This deck loses to itself. Maybe some of the other cards can be used in better Zombie decks. Happy Friday! I talked about Synchros for a while, so I thought we should end the week on the highest level Synchro they have: Gashadokuro, the Skeletal Mayakashi. Gashadokuro is a Level 11 DARK Zombie Synchro with 3300 ATK and 2600 DEF. Stats work fine on a Level 11, especially one that is easy to get out, DARK and Zombie are also two good traits. The summoning requirements are 1 Tuner and 1+ non-Tuner, so generic, but you’d probably only want to use this in Mayakashi. You can only control one Gashadokuro, probably cause they don’t want you setting up a Rank 11 play for a later turn, though there aren’t many Rank 11s, though this clause does make sense on the smaller Mayakashi Synchros. Each effect of Gashadokuro that I will mention are hard once per turns. 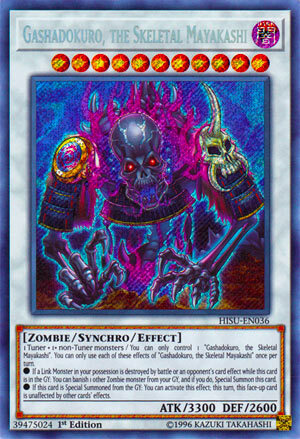 If a Link Monster in your possession is destroyed by battle or by an opponent’s card effect, you can banish another Zombie monster from your GY to Special Summon this card. If this card is Special Summoned from the GY, you can activate this effect to make it unaffected by other card effects for the remainder of the turn. All of the Synchros revive themselves by banishing another Zombie in your GY, and you can load some Zombies into the GY without much hassle with this. Considering all the Synchros only do this when a Synchro with two levels higher than it is destroyed and there is no Level 13, it makes sense that this might work with the Link Monster in the archetype, just hope that after you Link Summon that you can Synchro Climb back into this because giving up 3300 ATK for 1900 ATK with basically a useless effect without a Synchro isn’t too good, plus if you Link Summoned first, you might not be able to set one of these up in the GY to be revived even though you’ll likely be climbing into this after you Link Summon and they’ll have to get rid of the one on the field before you can revive this after the Link Monster is gone. The second effect sounds nice on paper, but considering it has to be revived while many other monsters just straight up can be unaffected by effects is annoying, even though there are a ton of revival cards in the game. One thing to notice about this effect is that this card does nothing on the field, and that might be what hurts Mayakashi the most. None of the Synchros do anything while on the field and rely on you reviving them for effects or your opponent killing a bigger Synchro, or Link in this case, to use their own revival effect. These Synchros would be much better if they did something while they were on the field, even if it isn’t that overpowered, cause in this archetype you are basically Synchro Climbing into vanilla monsters unless they are somehow revived. I like this archetype, and the revival thing isn’t that bad, but they could of been better if they had some sort of on field effect besides the restriction of only being able to control one, though that restriction on the Synchros might be necessary somewhat. Art: 4.5/5 I’d be scared for my life if I saw that. I’ve been saying this often on Fridays of late, but, did you not see this coming? Gashadokuro, the Skeletal Mayakashi is a gargantuan Monster…with an equally gargantuan name. A Zombie, Synchro Monster, that is Dark, and Level 11 (odd, pun intended) with 3300 attack and 2600 defense, both are great, who requires simply a Tuner and one or more non-Tuners (not even theme relevant) for a Synchro Summon. So, we’ve heard this three times now this week, if I recall, that we can only control one of these at a time. There are two separate effects here, each which can be used once per turn. *If a Link Monster of yours is destroyed by Battle or Card Effect and this resides in your Graveyard, you can remove a separate Zombie from play from your Graveyard to Special Summon this card back to the Field. Gives synergy with Yuki-Onna fro earlier, though your opponent will know this, so they might be focusing on removing your Zombies…but if they aren’t prepared, this should be easy enough to do. *If Special Summoned from the Graveyard, this card is unaffected by other cards’ effects…for the rest of this turn, and as long as this card is face-up. The protection is nice and does open up some other possibilities as well, involving beatdown at the very least, and some OTK. My biggest problem here is the 11 stars required to do this Synchro Summon. That’s likely going to be a three or four card investment Monster wise (not that I’m saying this isn’t worth it, just that’s lots of resources) but, of course, there are plenty of outside resources and ways to do this, and even if you do use that many Monsters, it could/should be able to be done in a single turn (so long as you have a Tuner) given the ease and swarming abilities of Zombies in and out of this theme.